Two posts that somehow involve books in one day? Surely we must be slipping around here. Fear not, as this product is the most high-tech way to perform such a low-tech task as reading a book. I’m of course talking about an eBook. The particular eBook in question is the Cybook, which happens to be one of the best-looking products of its kind that I’ve seen thus far. The Cybook from Bookeen has many of the same features that you’ll see in similar products. 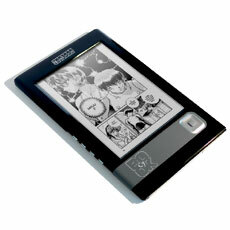 It uses an e Ink screen which has a high contrast that makes reading easy, even in direct sunlight. eBooks rate their battery life differently than most products. Due to the nature of the e Ink technology, it only uses power when you change the image being displayed. Thus, the battery life is measured in page turns rather than hours, this particular product will take over 8,000 turns. You get 64MB of internal storage along with an SD slot for memory expansion. That should give you plenty of room to store even a large collection of classic novels. If you’re looking for an alternative way to read your books, the Cybook is definitely the way to go. You can pick one up for $350 directly from Bookeen.